I'm running across Idaho to help raise money for my March 2011 attempt to run across Chile. 3. Osburn (Mile 22) -- Time: 7:35am - Going strong. 4. Smelterville (Mile 31) -- Time: 9:14am - down 2 pounds - Fingers swollen but he's doing great. 5. Surprise Scott sighting (Mile 33.5) -- Time: 9:56am - Looks tired but still smiling, a good sign. 6. Cataldo (Mile 40) -- Time: 11:04am - Long stop. Spirits dipped a little but still strong. Ate sandwich & a few chips. Fingers still swollen, not worse. 7. Black Rock (Mile 50.5) -- Time: 1:37pm - Left foot started hurting at mile 50. After a quick rub, he switched from Green Silence to Racers. 8. Medimont (Mile 56) -- Time: 3:01pm - Looking good and feeling motivated! 9. Harrison (Mile 66) -- Time: 5:55pm - Looking strong! 10. Chatcolet (Mile 73.5) -- Time: 8:11pm - Has stopped caring so much about time & pace; he's tired and wants to finish. His weight is good. He's regretting draining a blister. 11. 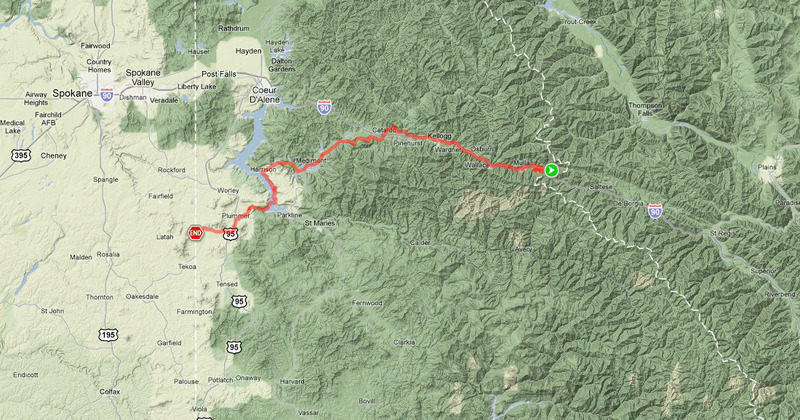 Plummer (Mile 81) -- Time: 10:04pm - He is so tired. 12. John Wayne Trail/Agency Rd. (Mile 88) -- Time: 12:20am - He's not stopping for a break; wants to be done. I'm going to give tweeting a try too (I'm tweetless so far). Follow me at twitter.com/scottmcmurtrey - hopefully I can tweet some photos while I'm on the trail. Have fun! Be safe! SMILE! Oh my goodness. Wow! Have a wonderful time!! Some great info from map-my-run! GOOD LUCK, GOOD LUCK, GOOD LUCK, GOOD LUCK! Have a great time! Can't wait!!! have a great time and be safe out there. Good Luck on Saturday! Is that a dirt or pavement trail? Thanks, everyone. It's going to be quite the adventure, I'm sure. The weather forecast looks good - highs around 70, lows in the 40's. So I don't think I'll have to deal with too much heat. You're starting on my birthday which must mean you will do awesome! :) Wishing you lots of luck! Good luck and have a great week end. Good luck! Can't wait to hear the whole report! Sadie wants to do it! Special thanks to my sister Melanie, who will be in charge of posting the Race Day Tracker updates. Thanks for the info,looking forward to your report. WOW, WOW and WOW!!!! Hopefully you are sleeping soundly right now. Congrats seems so small in light of this accomplishment. You rock! It was a day to remember. Report and photos coming soon. Fantastic! can't wait for the report. Nicely done, dude! Now you hafta run Idaho from north to south. Wow! What an amazing adventure! Great stuff, love it. Of course it is totally unreasonable to run across Idaho on your own, not even for a buckle. That's the core of ultra running. Reason does not come into it.